I like food outlets offering customers the option to bring their own wine; especially those which waive corkage fee .. (yes, which wine enthusiast wouldn't). 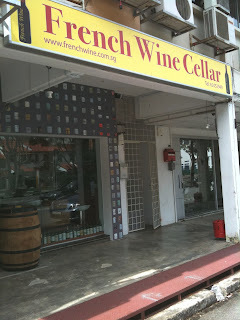 One such outlet is Bonifacio Restaurant at 35 Kreta Ayer Road, Singapore (Tel: 62226676). It is conveniently located within a short walking distance from Outram mrt station. It serves a wide range of pinoy cuisine from vegetables to seafood, meat and dessert dishes. On wednesdays, customers are allowed to 'BYO wines' with corkage waived. The restaurant also offers diners decent sized wine glasses for their use. I usually go in a group consisting of 6 to 10 wine folks. This way we can order a wide variety of dishes and try pairing these with sparklies, whites, reds and sweet wines we bring along. Food pairing gets all the more interesting with the addition of spices and asian flavours. Being a meat lover myself, I particularly enjoy the crispy deep-fried pork knuckle and lamb-shank dishes during my visits there. Do check the place out if you are around the corner. Ask any serious wine investor and he will say that if given a choice, he will rather buy magnum sized bottles rather than the standard 750ml ones. Current wine-lore has it that the bigger sized bottles age better and brings a better price when sold in the future. In Singapore one easily sees the magnum (1.5 litres) and occasionally the double magnum (3 litres which goes by the name of Jeroboam). 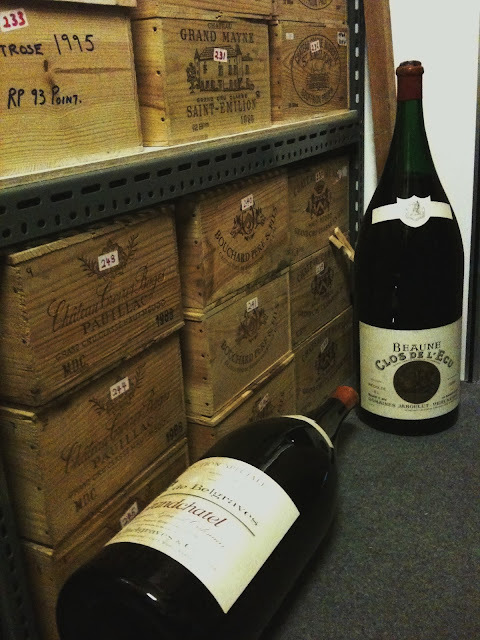 Recently I got the opportunity to see two 15 litres sized bottles at AA French Wine's retail outlet. A 15 litres bottle holds the equivalent of 20 standard bottles of wine. Its called a Nebuchadnezzar (named after a Babylonian king). Both bottles were from France, each retailing for slightly less than $2,000. If you are organizing a big dinner session at home, the Nebuchadnezzar will easily accommodate quite a few guests! A wine retail outlet with a difference. I came to know of this newly set-up outlet from a good friend and fellow wine enthusiast Edwards. By appearance this outlet looks simple and laid back (well, it is); but walk within and a cellar full of back vintage french wines greet you. Its a place for those who are keen to purchase older vintages of French wines. The owner, Nelson Foong, purchases back vintage of french wines at auction houses abroad and retails them here. If you are one of those who enjoy tasting older vintages, this place is an ideal haven. It has wines with vintages going as far back as 1950s. Those who appreciate Bordeaux wines will attest to the notion that it is good to age these wines a few years and let them evolve a little before consuming them. Aging helps to soften tannins, develop complex flavours and create a better balance in quite a few bordeaux wines. A plus point with this wine shop's location is the fact that there is an eating house at the end of the row. You can consume your wine at the eating house without the need to pay any corkage for the bottles you bring along. What's more, the affable Nelson Foong readily offers proper wine glasses for your use if you need some! Just go have a look if you are in the neighbourhood. For this year 2011, the Academy of Wine Singapore Pte Ltd is bringing in the Certified Specialist in Wine (CSW) and the Certified Specialist of Spirit (CSS) programs to Singapore. Though the CSW program has previously been conducted several times in Singapore, this is the first time the CSS is planned to be conducted here. Both programs are certifications awarded by the Society of Wine Educators (USA). These programs brood well for the training and certification of the growing number of f&b folks in the local scene and enthusiasts keen on wine and spirits. One great plus is the fact that those keen need not travel all the way to US to qualify for these certifications. The exams for both these certifications are held in Singapore.